Once again the dodgers beat the hawks and continue their playoffs run undefeated! For the Tomahawks, Gloria H had 20 points (2x3pt) followed by Rookie Sensation Monde S with 13 and Meke N with 11, while Izola A had only 10. Janet B scored 27 points (2x3pt) for the Dodgers, of which 10 were made in the 1st quarter, while Clara M had 20 followed by Vivien A with 13. For Stormers, Eliaser N scored 10 points (1x3pt), followed by John M with 8 (2x3pt) and Ronnie M with 7, while Wellington A had 5 (1x3pt). T'Hawks Luis A lead all scorers with 26 points (2x3pt & 7 dunks), followed by L Murere with 24 and PG Freddie A with 19 (2x3pt). This time around, Paulo C had 13 points (1x3pt). Oops, she did it again! Victoria K had 18 of the 30 points scored by her team. This player is "NUMERO UNO" MVP contender for the 2005 season. Starzz's Chenai D had 25 points, followed by Tessa A with 14 (2x3pt) and Elina A with 12 (2x3pt). Poly's Didier N dunked on Civics' Collin I leaving him wandering what just happened. Not too long after that, the so long await moment happened, Suns' Coulson J dunked over Blues' BD da Silva! Both dunks were 3 point plays. Blues' BD da Silva lead all scorers with 36 points, followed by Martin F with 16 and Didier N with 10. Suns' Eric N Junior scored 23 points (2x3pt), followed by Coulson J with 22 (1x3pt), while Mpume H had a season low 11 points (2x3pt). 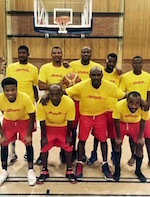 Carabinieri's J Shapumba scored 21 points (3x3pt), followed by Mandume S with 20 (5x3pt), while S Justice had only 11. "GORO" Tsheehama had 10 and blocked a couple of shots as well. Rebels' Brian H had 30 points (4 dunks), followed by Nigel M with 22 (3x3pt) and Mao M with 16. I haihambo had the usual 6 points from the 3pt line.